Soak chickpeas in cold water for 12 to 24 hours. Drain the chickpeas and transfer to a food processor. Add 1 cup parsley, chopped onion, garlic, 1 tablespoon oil, 1 tablespoon lemon juice, cumin and ½ teaspoon salt; process until finely and evenly ground. Shape into 12 patties (1½ inches wide), using a generous 2 tablespoons each. Heat 2 tablespoons oil in a large nonstick skillet over medium-high heat. Reduce heat to medium. Cook the falafel until golden brown, 3 to 5 minutes. Turn, swirl in 1 tablespoon oil and cook until golden on the other side, 3 to 5 minutes more. Meanwhile, whisk tahini, water and the remaining 2 tablespoons lemon juice, 1 tablespoon oil and ½ teaspoon salt in a large bowl. Transfer ¼ cup to a small bowl. Add romaine and the remaining 1 cup parsley to the large bowl and toss to coat. 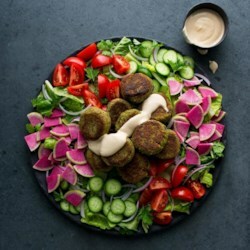 Top with cucumbers and/or radishes, tomatoes, the sliced onion and the falafel. Drizzle with the reserved ¼ cup dressing.